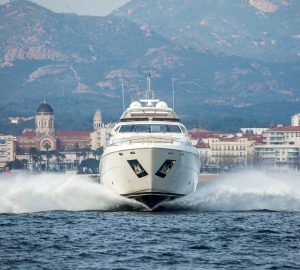 Luxury motor yacht JAG’B was delivered by the renowned Italian shipyard Ferretti in 2015 and measures 29,2m (95,10ft) in length. 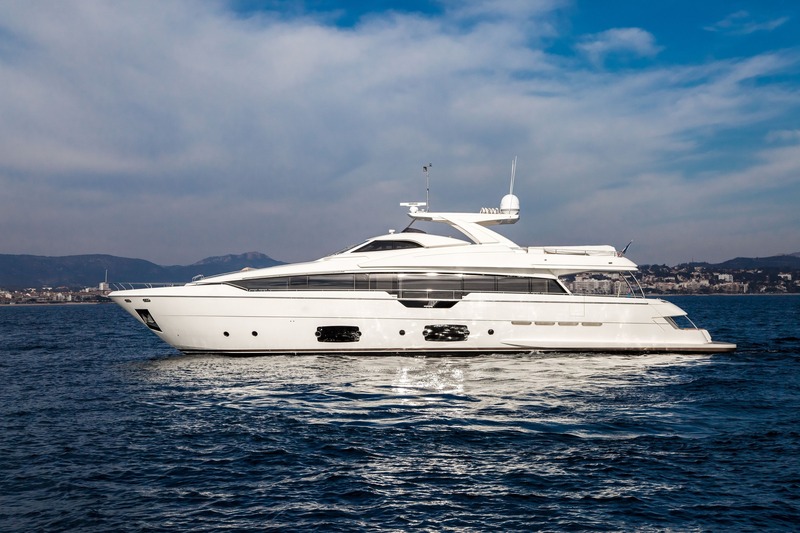 M/Y JAG’B accommodates up to 10 guests, in 5 spacious double cabins, each with private en-suite facilities. 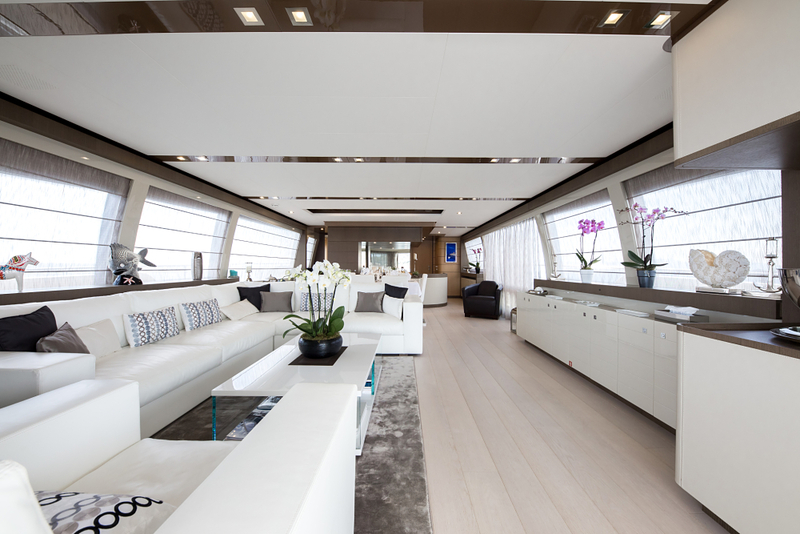 Charter yacht JAG’B features a contemporary minimalistic interior décor. 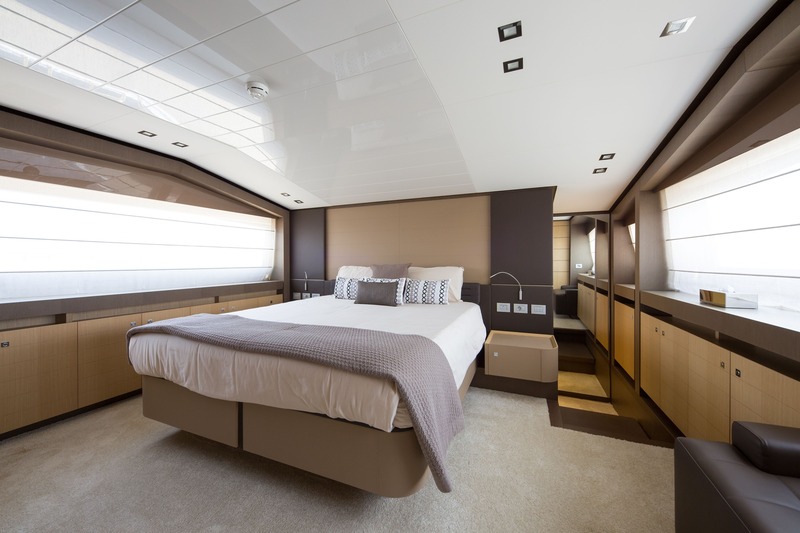 Earth tones, crisp white soft furnishings and warm lighting, create an elegant ambiance. 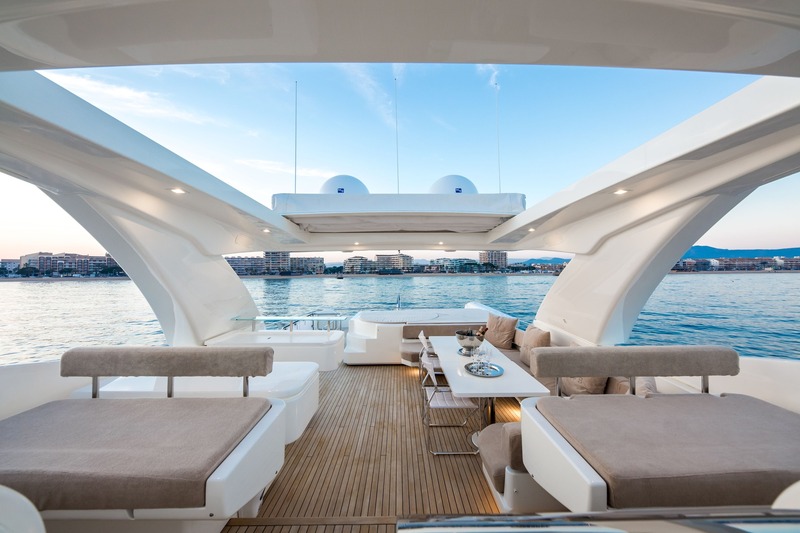 The salon and dining is an open plan, with a generous lounge aft, offering a plush L shaped sofa, occasional chair, glass coffee table and entertainment systems. 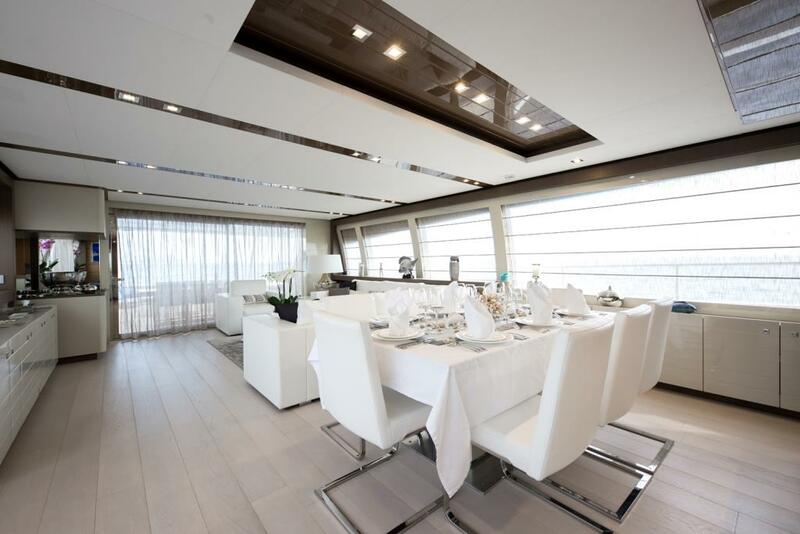 Forward a modern clear glass formal dining table is flanked in high back leather chairs. 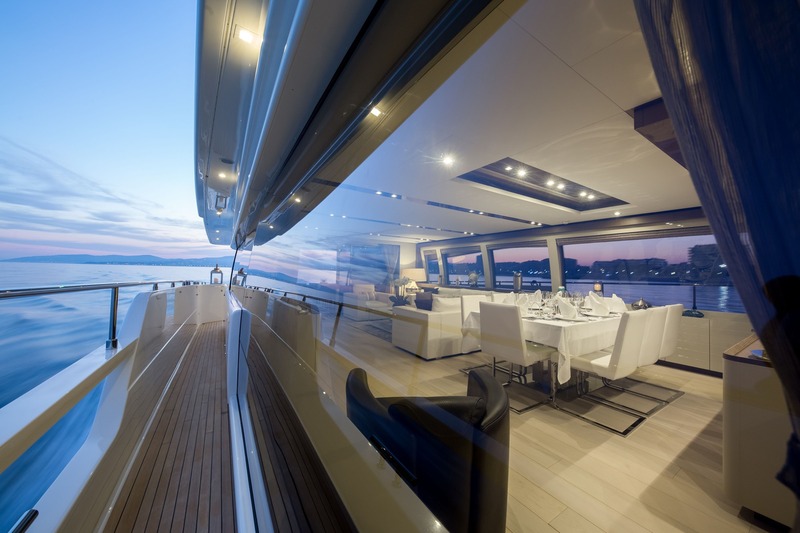 Elongated side windows provide ample natural light, while custom blinds give optimum privacy. 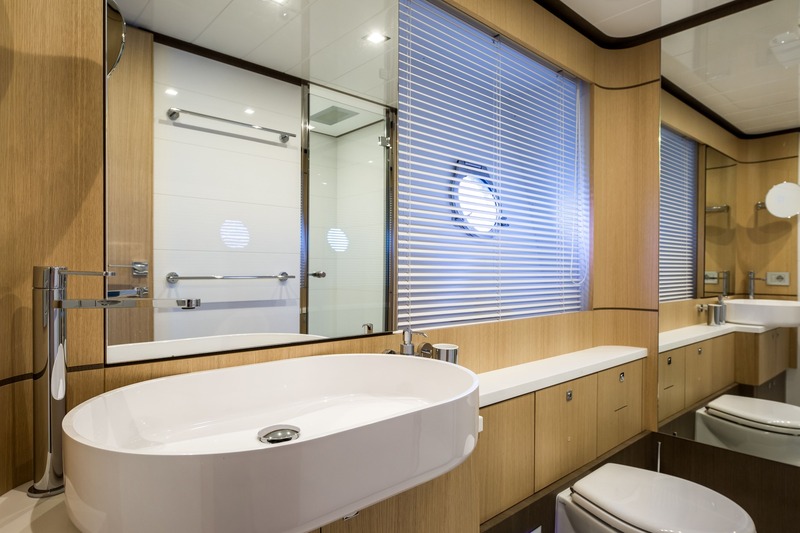 Guest accommodation is in the master cabin forward on the main deck, plus 4 double cabins on the lower deck. 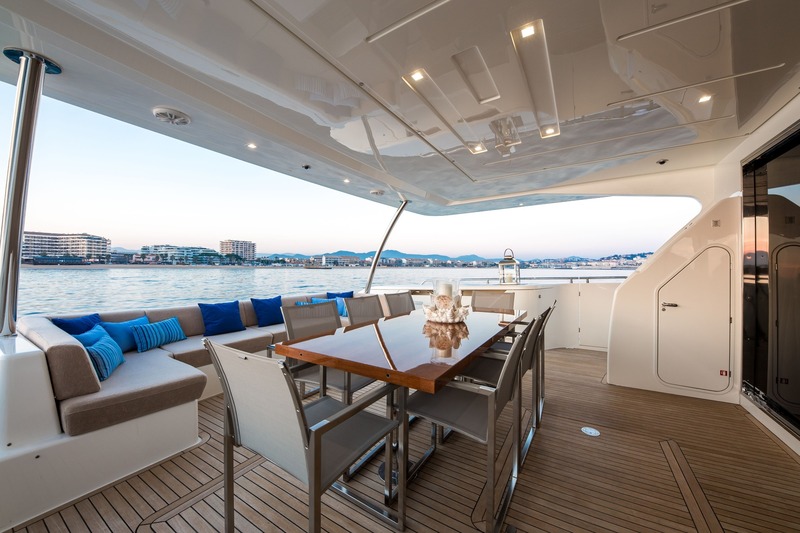 The Ferretti motor yacht JAG’B has fabulous exterior living areas. 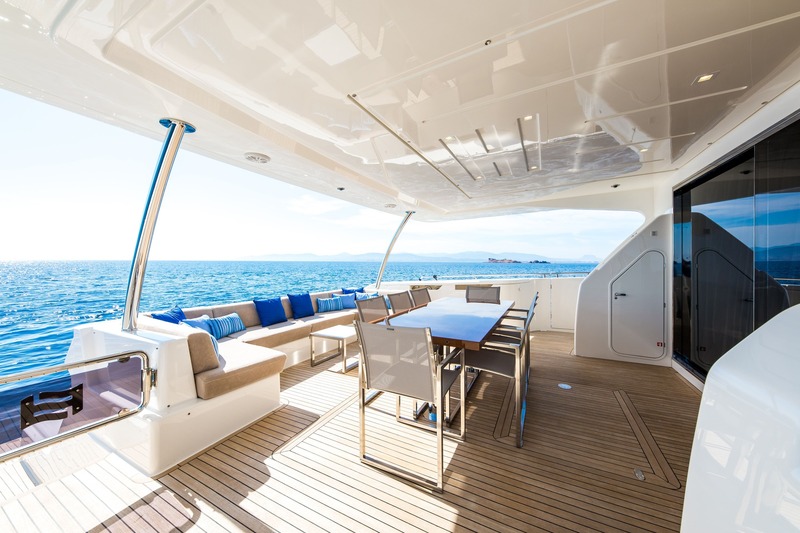 For the perfect social venue, the aft deck is well-appointed, complete with direct access to the salon, an alfresco dining table, partial shade and ample space. 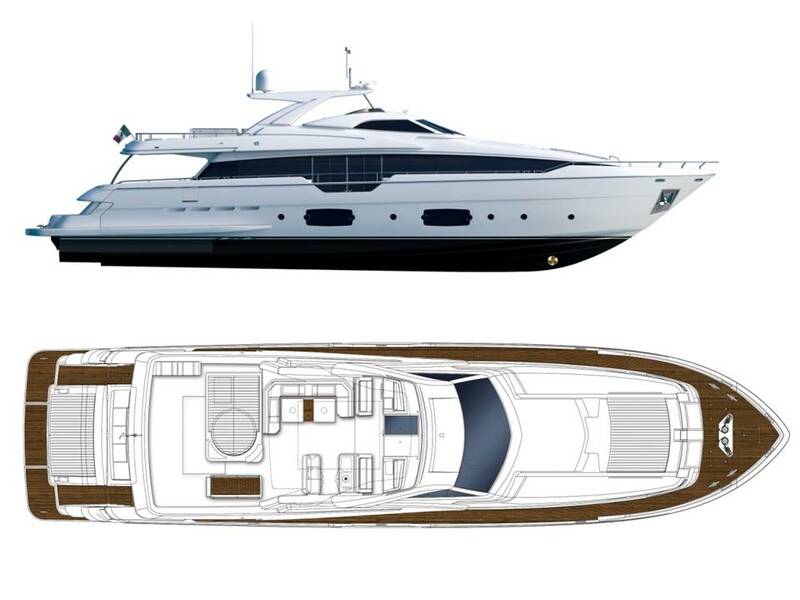 360° wrap around decks lead to the capacious foredeck, offering comfortable built in seating and a large raised sunpad. 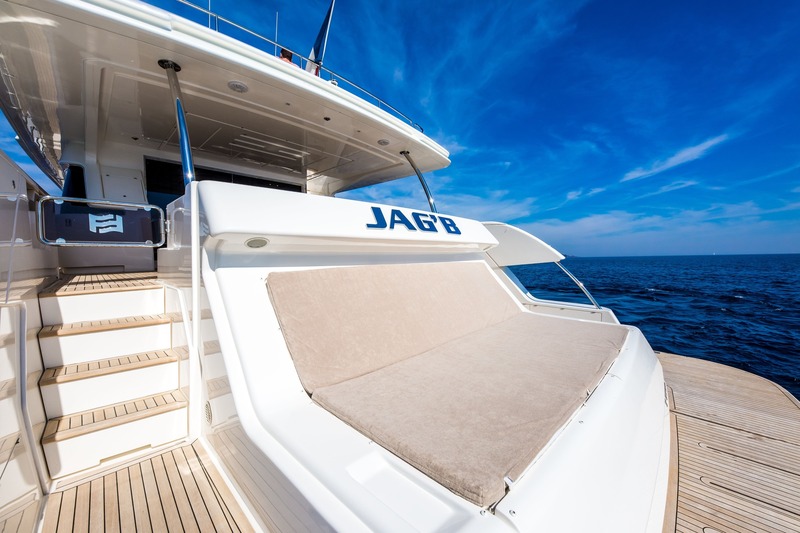 JAG’B’s upper sundeck boasts a further alfresco dining option, seating, sunpads and deluxe Jacuzzi tub. 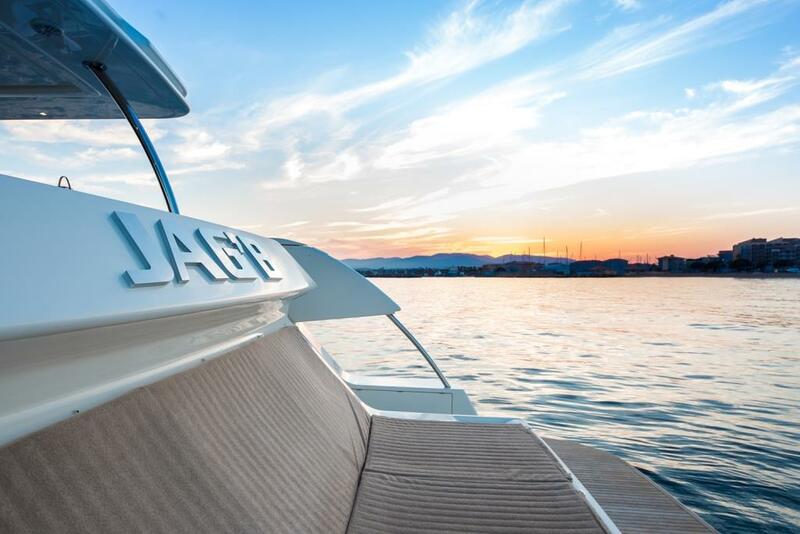 The transom is innovative and functional, offering an extended swim platform for easy water access and built in upholstered seating area, ideal for watching the water enthusiasts make the most of the sea toys on offer. 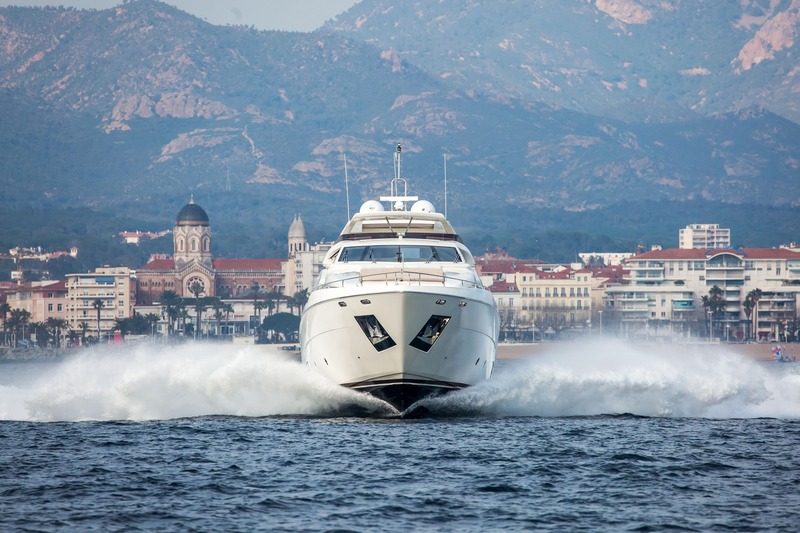 Powered by 2 x MTU 2,638hp engines, the motor yacht JAG’B cruises at 24 knots. 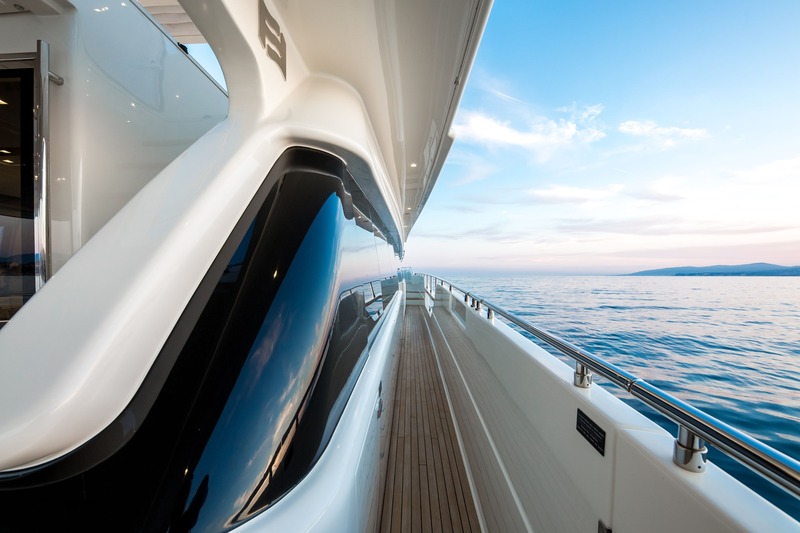 The yacht boasts at anchor stabilizers, ensuring optimum comfort. 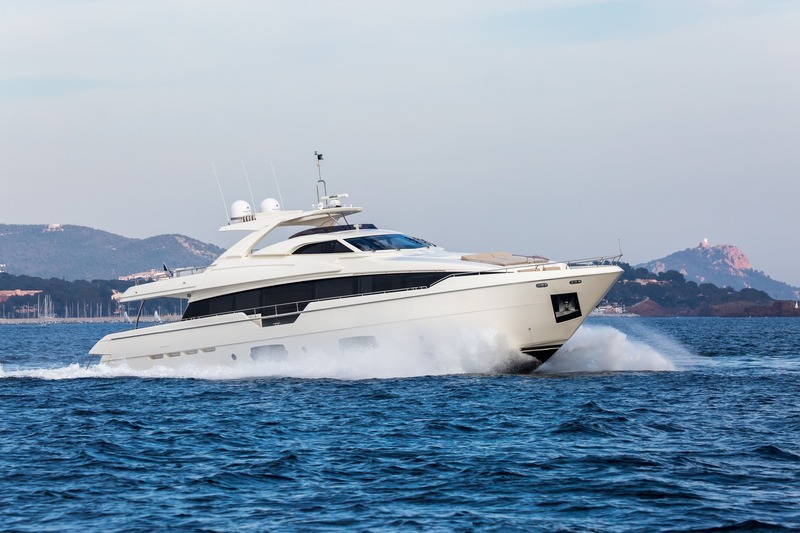 Luxury Ferretti motor yacht JAG’B accommodates up to 10 guests, in 5 stylish en-suite double cabins. 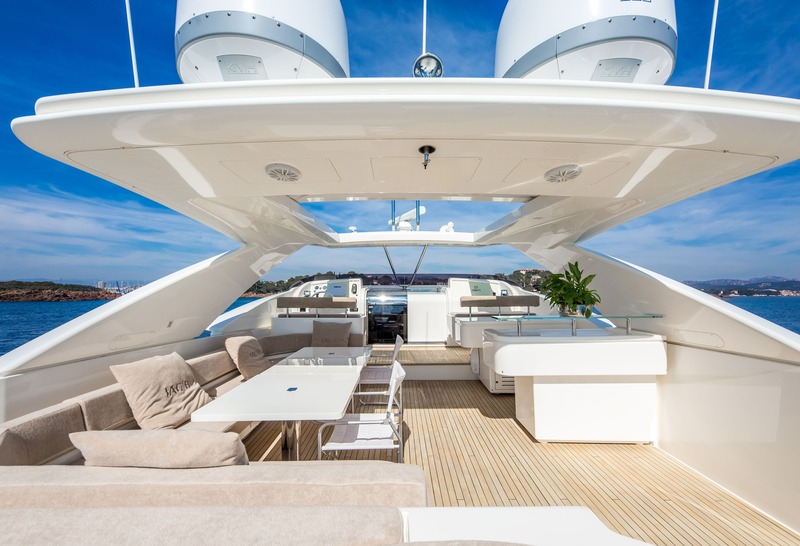 The master stateroom is on the main deck forward and full beam of the yacht, with a center lined king size bed. 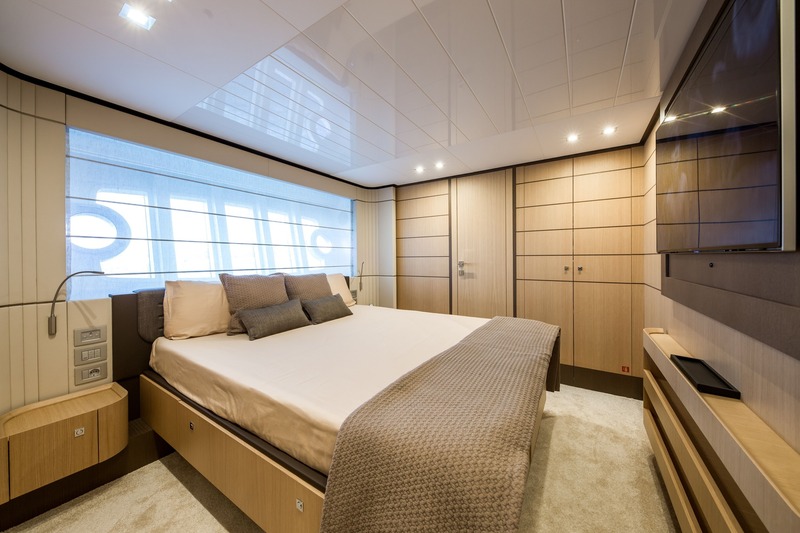 Below decks are 4 opposing cabins on port and starboard, each with a walk around queen size bed. 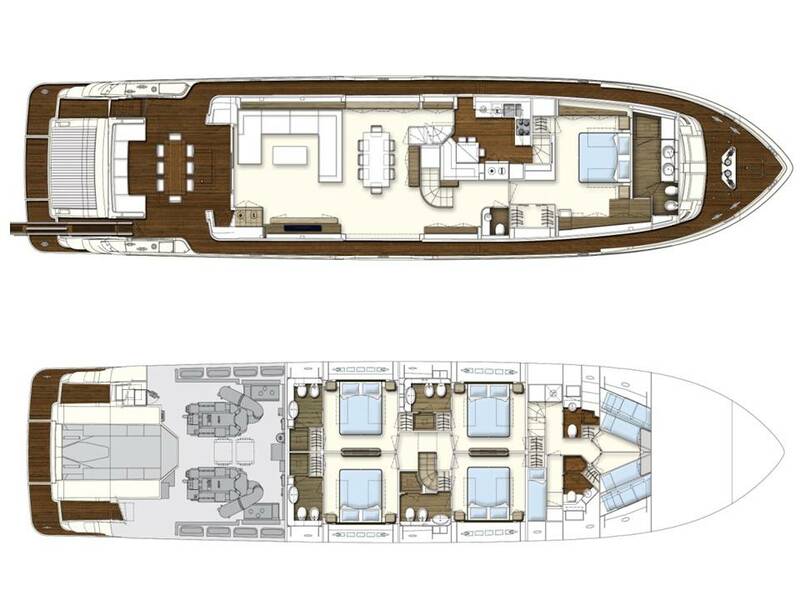 All 5 cabins benefit from large in windows and offering spectacular views and an abundance of natural light.